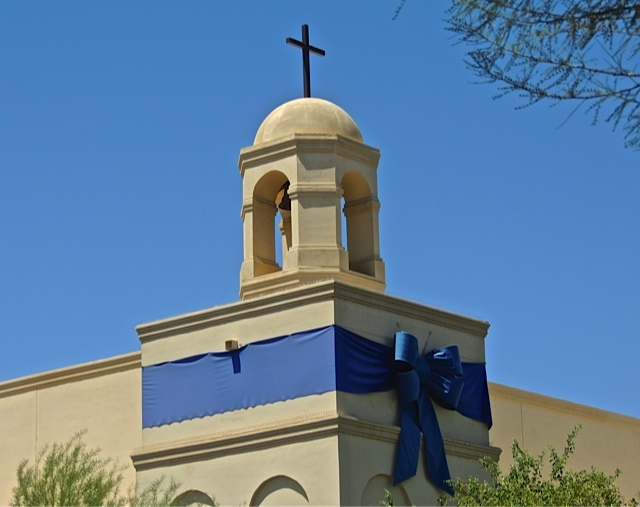 I saw this big blue ribbon tied around the bell tower corner at Xavier College Preparatory school yesterday when I was driving by. I can only guess that it was up there for graduation ceremonies but, ti's only a guess. It did catch my eye. 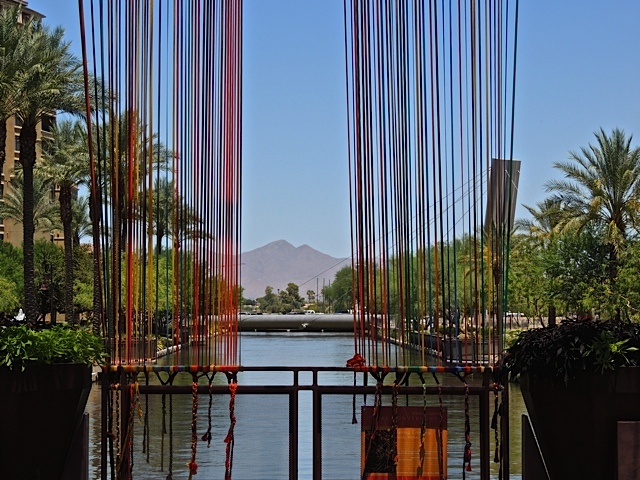 I was in Scottsdale for lunch on Friday and when I was walking back to the parking garage, I noticed something strange on the Marshall Way Bridge that crosses the canal. So I walked over to take a look. 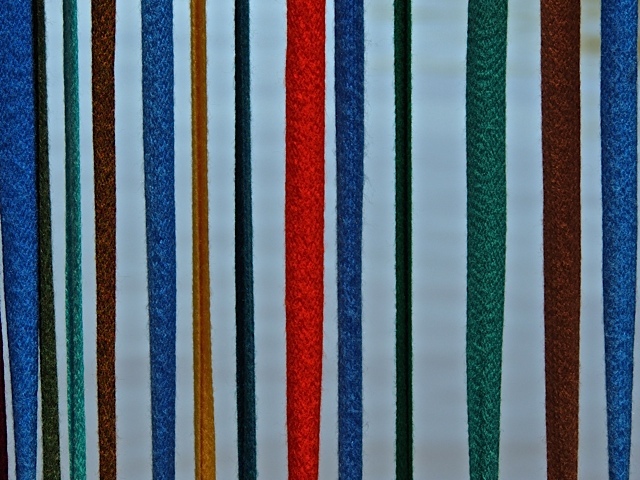 The entire bridge was wrapped in these colorful fibers. I turns out to be part of the Canal Convergence Spring Equinox Art Project sponsored by Scottsdale Public Art and Salt River Project (one of our utility companies). The piece is by Minneapolis based artist Randy Walker an artist who "views existing built environments as a framework for artistic intervention." 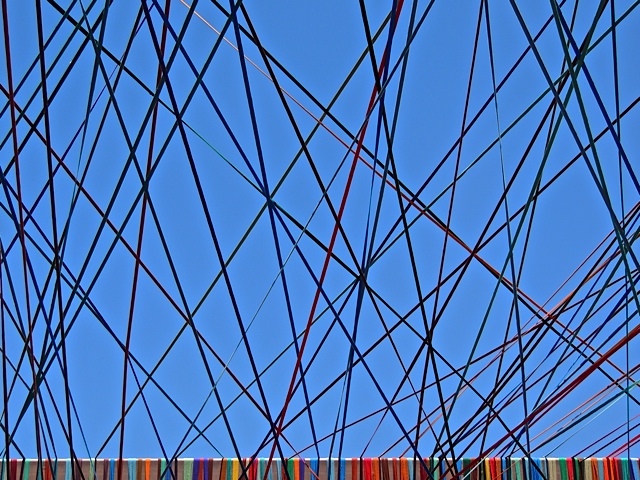 The piece is constructed from thousands and thousands of feet of acrylic braid spread across the bridge's framework in different patterns and positions. The view above looks out over the canal toward the Paolo Soleri Bridge in the background behind the fibers. Here is a closer view of the fibers used in the creation. 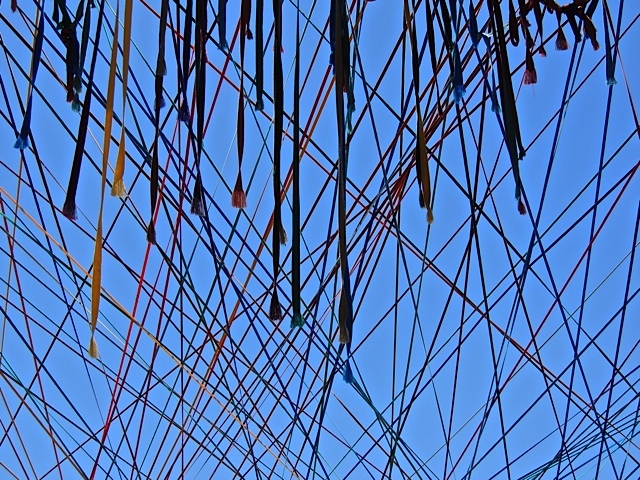 Walker and Scottsdale Public Art are "exploring options for repurposing the fiber used in this installation in a community collaborative project following this exhibition." I can't wait to see what that might be. Remember, the theme for July 1 is "Celebrating Summer". Just a little quiz for this Saturday morning. Can anyone guess what this is? Here's another view. I'll tell you all about it tomorrow! I watched these rings in the water for a long time and I couldn't figure out what was causing them. 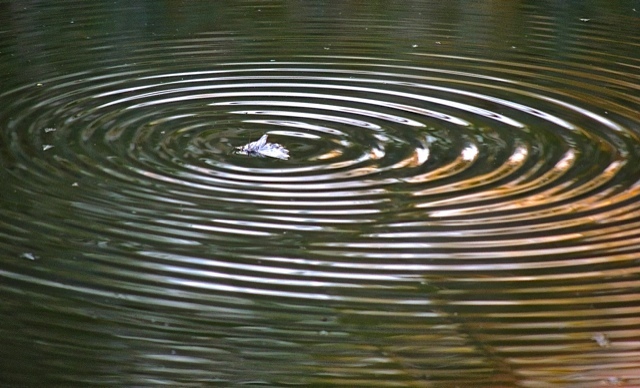 After I downloaded the photo, I zoomed in on the center and could see that is is a moth caught in the water. The movement of the water was a bit mesmerizing. The theme for July 1st is "Celebrating Summer". I took this photo to show off a corner on the northern edge of downtown Phoenix and show how the old buildings have been restored and new tenants have moved in. 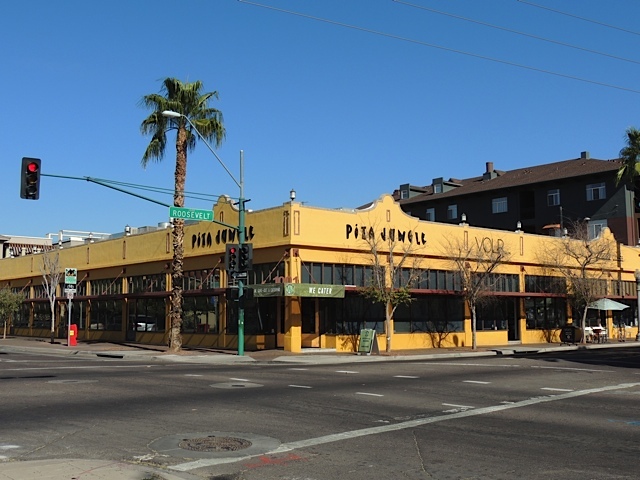 The corner spot is the downtown home of Pita Jungle, a locally owned restaurant that features Middle Eastern, Mediterranean, healthy and vegetarian food. It's excellent food in a casual atmosphere. I go there often. There is also a coffee shop (shown on the right edge of the photo) and a few other small businesses and offices in the same building. It's a nice reuse of the building and it fits right in to this historic neighborhood. About two weeks ago, I was having lunch in a Scottsdale restaurant that I had never been to before. 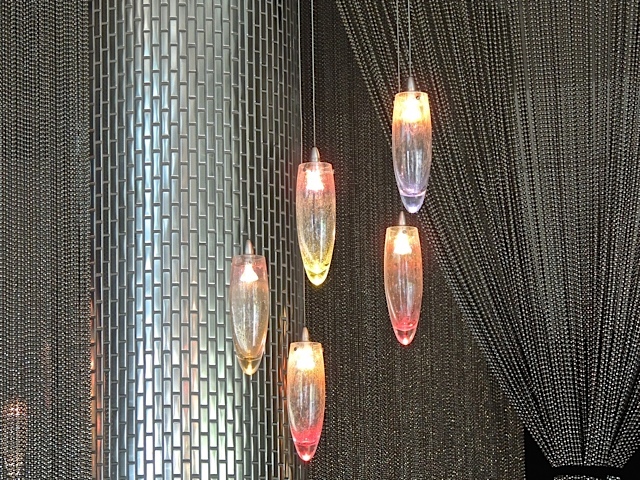 I was comfortably seated in a tastefully contemporary dining room and while I was waiting for my food I started noticing all the little decorative details around me. That's when I saw that this shot might create a very interesting abstract photo and I must say I was pleased with the results. 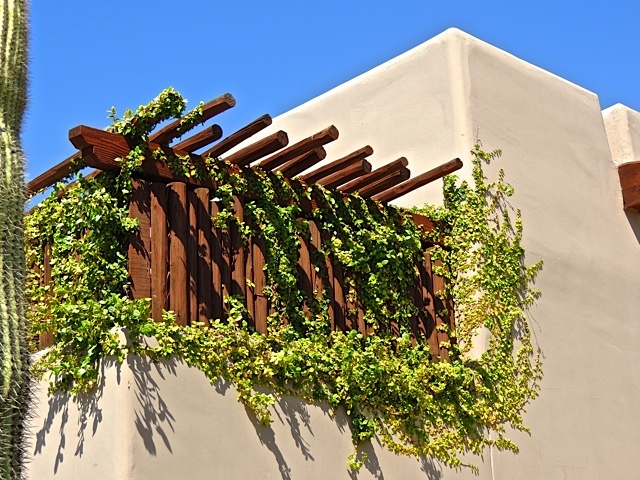 Can you tell from this photo where I found my abstract inspiration? The restaurant is called simply "Bobby's" and when I saw that it was a Mancuso restaurant, I had to give it a try. The Mancuso family has been serving outstanding Italian cuisine for many years in the Phoenix area. 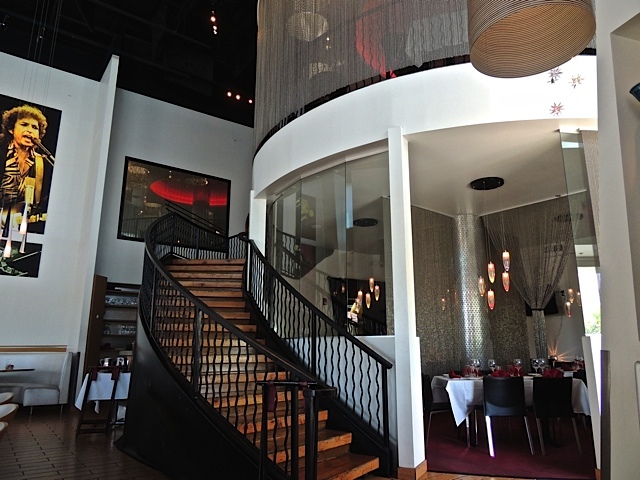 This new restaurant also serves as a jazz club with music nightly in the second floor lounge. 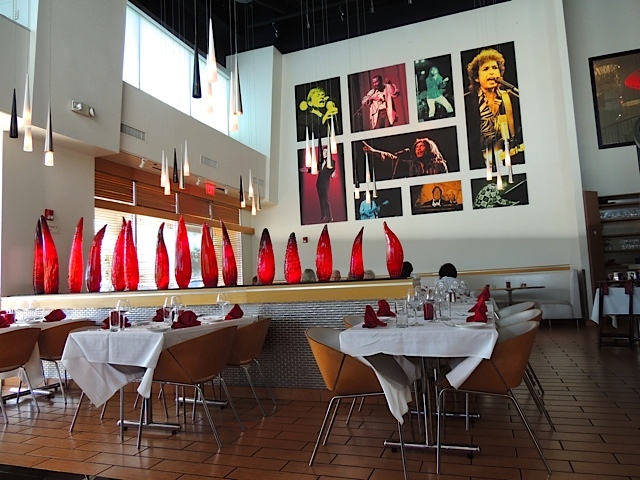 The other half of the dining room is decorated with red glass and a wall of photos of musicians all named "Bob". Very clever. Oh yes, the food was delicious! Reminder: The theme for July 1st is Celebrating Summer! 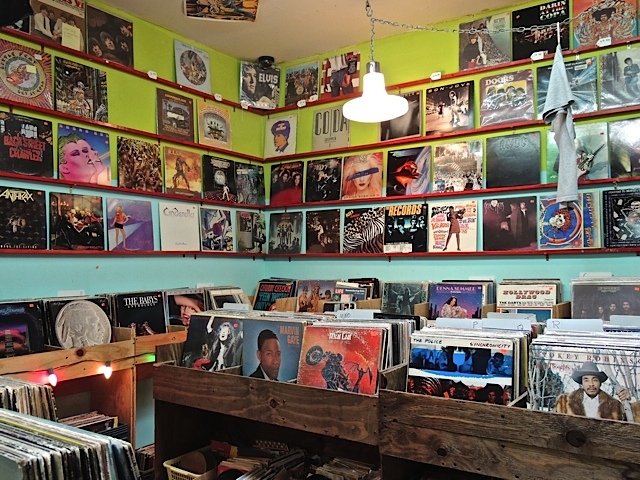 While wandering around in an antique store, I came across this room full of record albums. Many of these covers are very familiar. I'm sure I used to have them in my collection at one time. Which leads to the question...how can these be antiques? Okay, I guess "antique" is better than "obsolete". It's still cool enough at 6:00 AM to take my walk in the garden and that's what I did yesterday morning. The garden has some major construction going on right now so the main path is closed and a detour has been opened on a trail that usually serves only staff members. 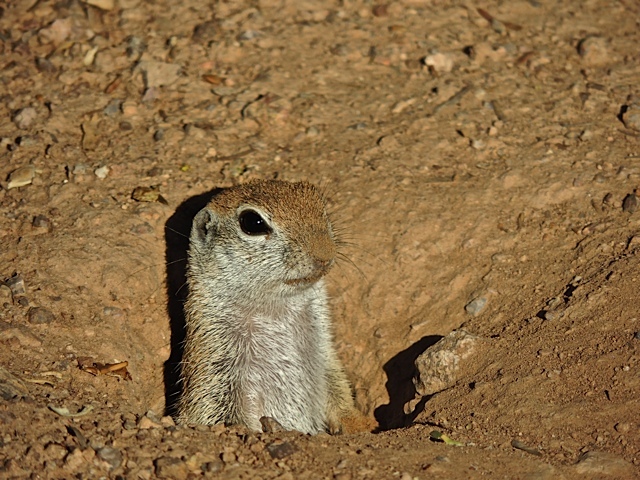 Along that trail is field full of ground squirrel underground homes. As I walk past, I always feel like I'm being watched and as it turns out I am! This one thinks he's hiding from my camera. 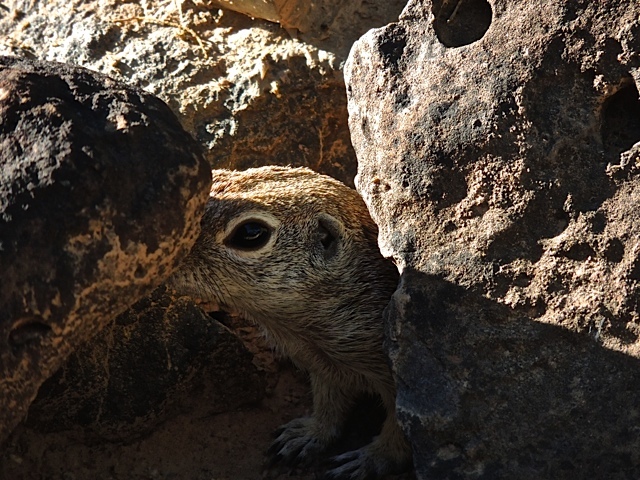 Wrong little guy, I can still see you. This one looks like he's saying "you again?" 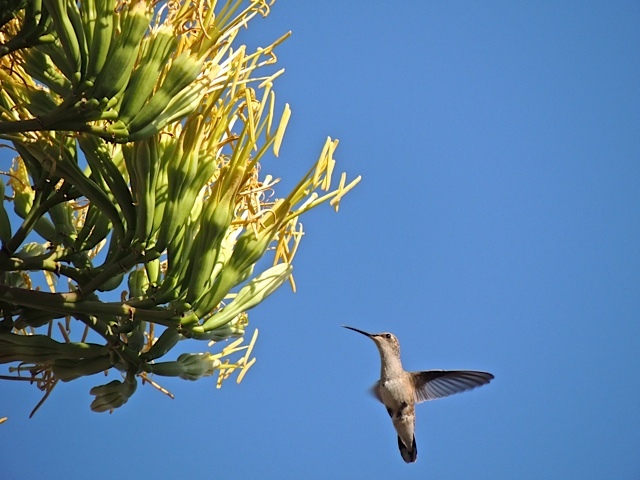 This tiny little hummingbird was aiming for a very tall century plant bloom when my shutter caught him mid-flight. He and a friend were buzzing all around the blooms. I looked to see if I had a photo of the whole century plant so you could see just how tall it is and this one is the only one I could find. Obviously, I took it back when the Chihuly exhibit was at the garden. The flowers on the century plant hadn't opened fully when I took this shot but, you can see how tall it is. I have a new post on Sharon's Sojourns today. I'm making a visit to one of my favorite fountains. 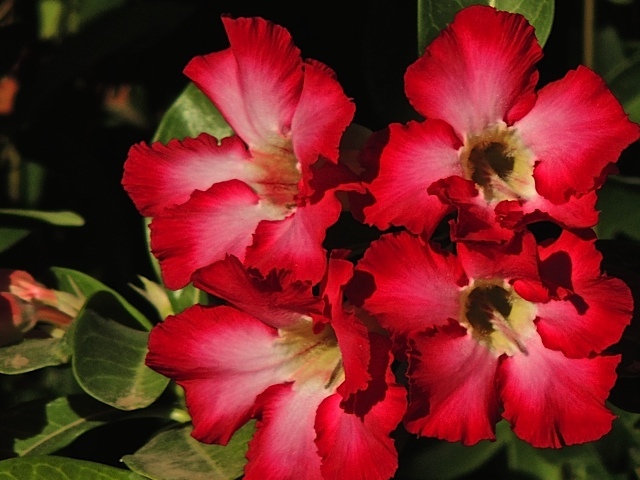 I've taken many photos of this plant called Desert Rose but, I don't believe I've ever posted one before. 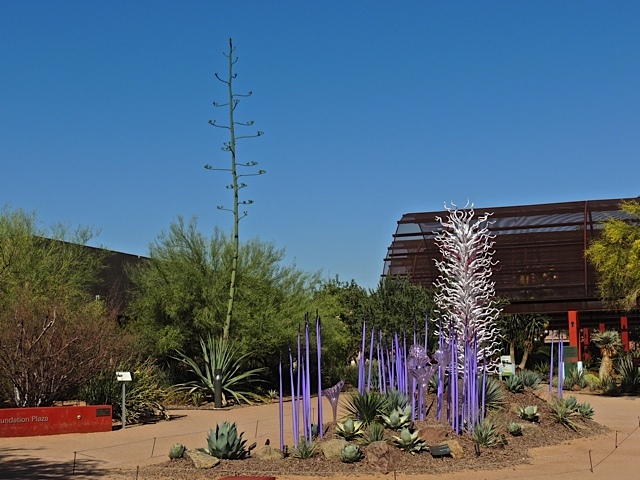 The Desert Botanical Garden as several of these plants and they are all growing in large pots that are scattered throughout the garden. 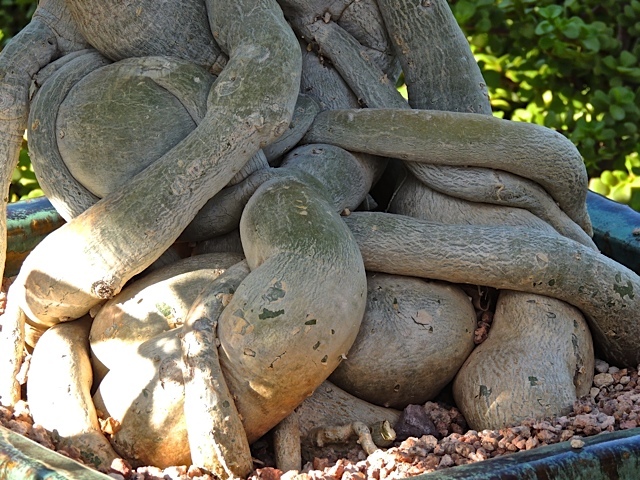 The unusual thing about the plant is their root system. 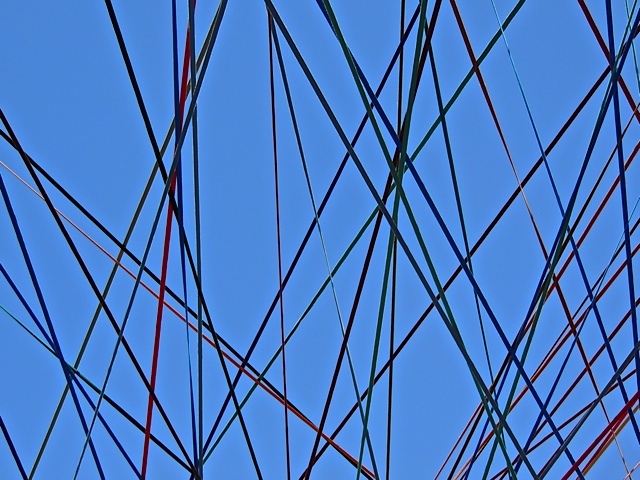 As you can see, it's all twisty and tied in knots. 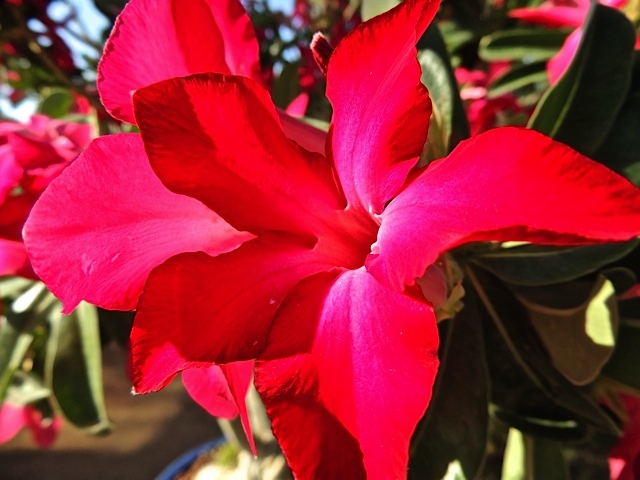 It appears to bloom all year long with these pretty red flowers. I wonder if I could grow one in my yard. 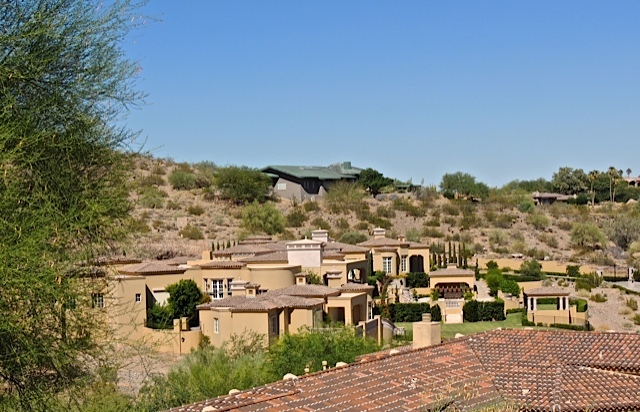 Yesterday afternoon I had an appointment on the east side of Phoenix and when I was headed homeward I remembered a house I had seen under construction one or two years ago up on the mountain slopes just north of Camelback Road. So, I drove up there to see if I could see how it turned out. It was hard find a place where I could get a photo of the whole, monstrous thing but I finally found a spot on the hill above it but even this view doesn't really give the full impact of it's huge size. It actually looks more like a resort than a home for a single family. I simply can't imagine the amount of money it takes to build and then live in something this huge. It looks like this little guy is give me the thumbs-up for the food. 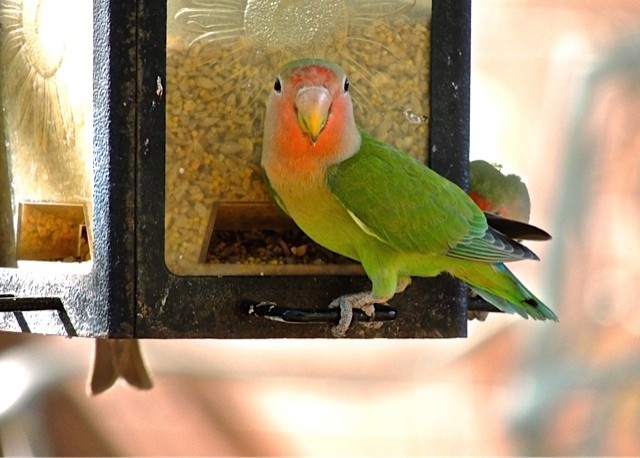 While I was in Scottsdale last week, I stopped at the Wild Bird store and picked up some of their favorite bird seed mix. No sooner had I filled the feeder than there they were, chowing down. They must keep a close eye on my back-yard activities. There were quite a few guests using the overstuffed wicker patio furniture that were located near the doors to the main lobby so I didn't intrude on their privacy with my camera. 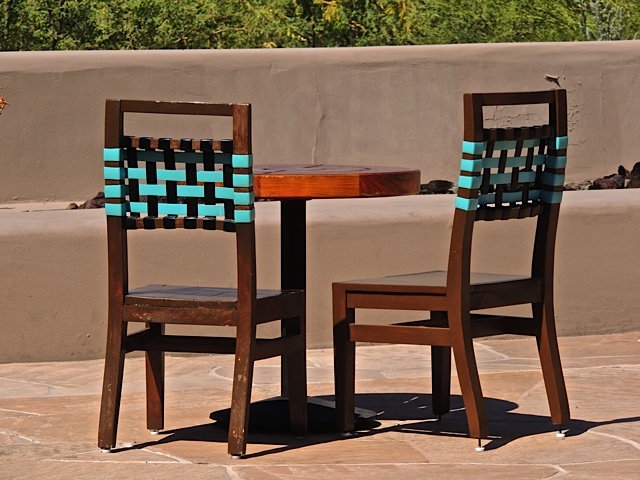 Instead, I was drawn to the other end of the patio by a splash of turquoise that I could see in the distance which turned out to be these colorful chairs. What an attractive combination of color and pattern. And, the view from here wasn't bad either. 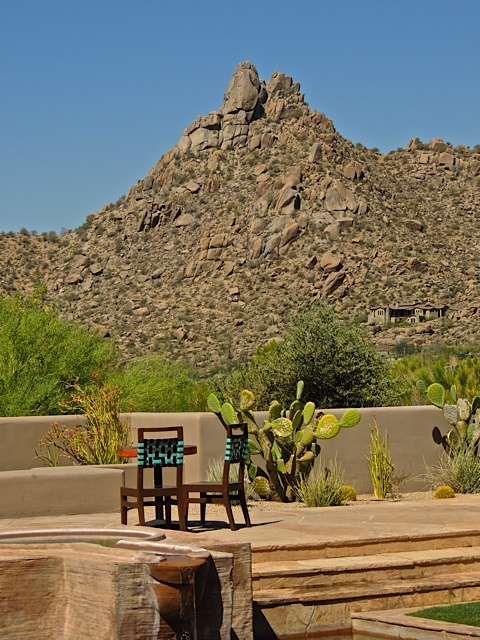 This might be a great spot to sip some orange juice in the morning while watching for some wildlife activity on the hillside in the distance. 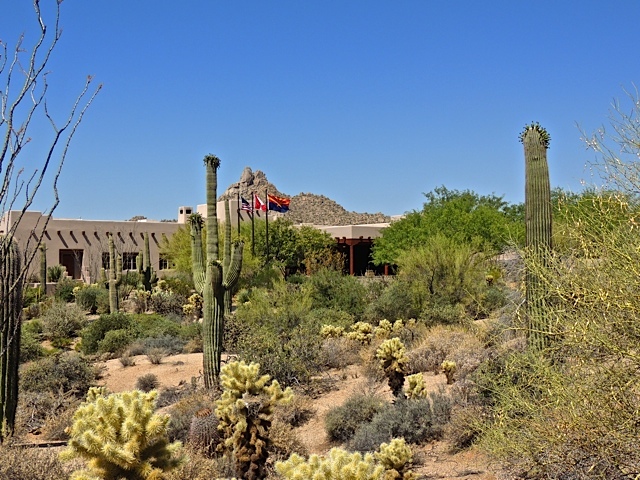 That concludes my tour of the Scottsdale Four Seasons resort. I hope you enjoyed the visit. 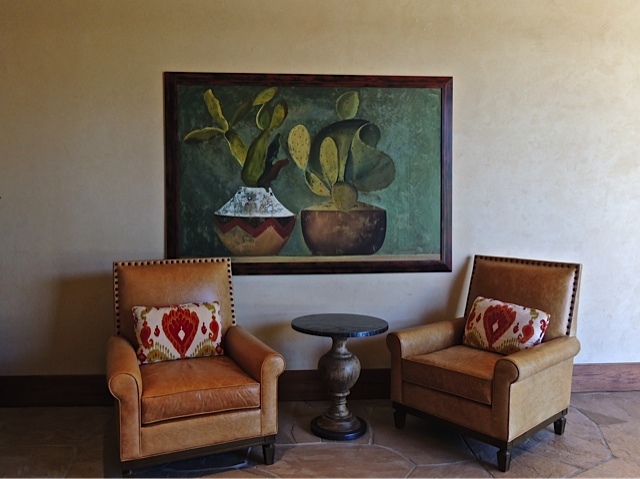 The lobby of the Four Seasons resort is decidedly Southwestern Style with lots of leather and big pillows. There was even a fire burning in that fireplace which surprised me since the temperature outside was right at the 100 (38c) mark when I was there. I spent a lot of time admiring the artwork around the facilities. 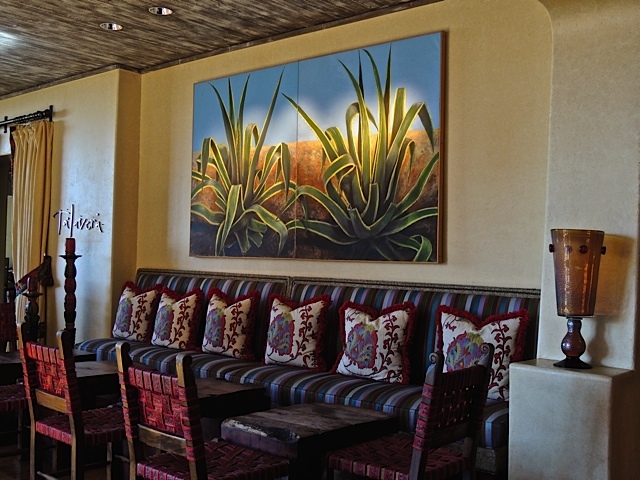 Almost all of the paintings were of the plant life found in the desert and since I enjoy taking photos of the very same vegetation, it was wonderful to see these almost photo-like paintings. I was tempted to sit for a while in one of these big, comfy chairs but, I kept on moving around the next corner. I'll have a few more photos tomorrow. 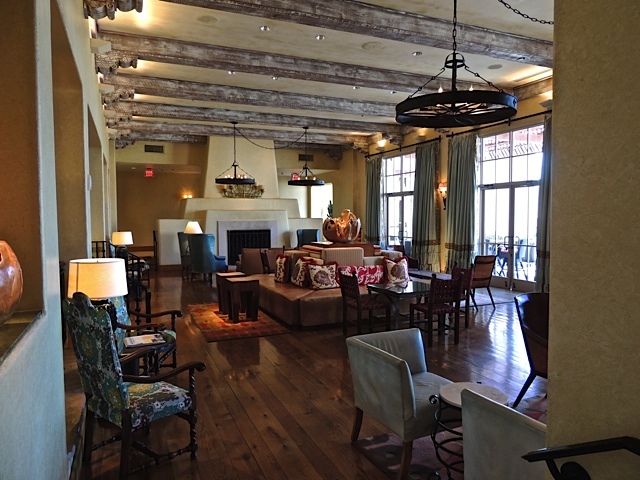 I took a drive out to north Scottsdale, way north Scottsdale, to check out the Four Seasons resort. It's fairly new and I had not been there before so I thought it might be a good place to take some photos. Two things about the resort surprised me. 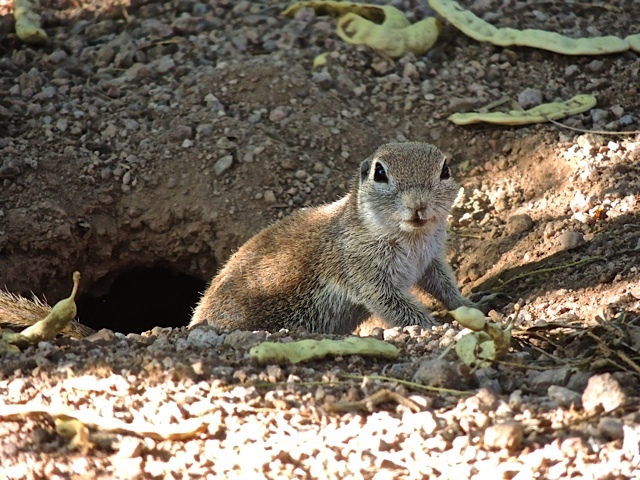 First surprise was how well it blends in with the surrounding desert. It blends so well that I drove right past the place and had to turn around and go back. Second surprise was now many people were there. The parking lot was full and I saw many guests relaxing in different places around the property. I might expect a lot of guests in January or February but, June seems like a strange time to visit the desert. But, I guess if 4 million of us can live here all summer then a few northern and easterners can visit here in the summer. 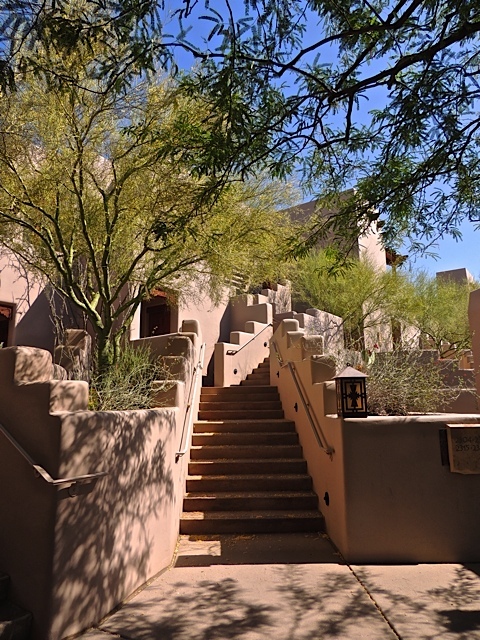 As you can see from these photos, the style is distinctly southwestern in what might be called Pueblo Style. I'll post a few more photos tomorrow. 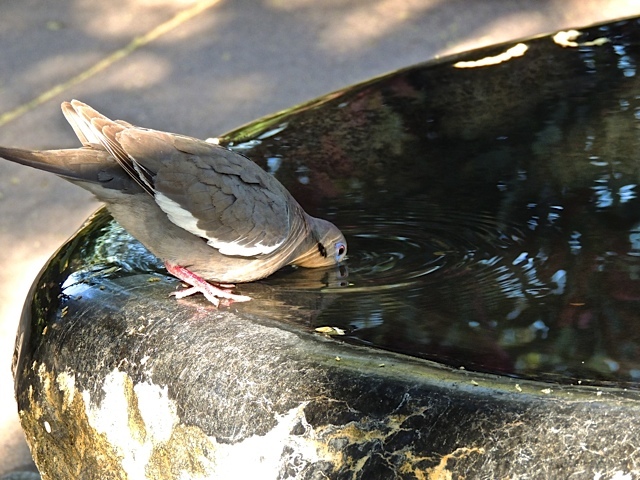 This little guy is head first into the water to get a drink. I have a new post on Sharon's Sojourns today. I'm stepping into a science fiction novel. 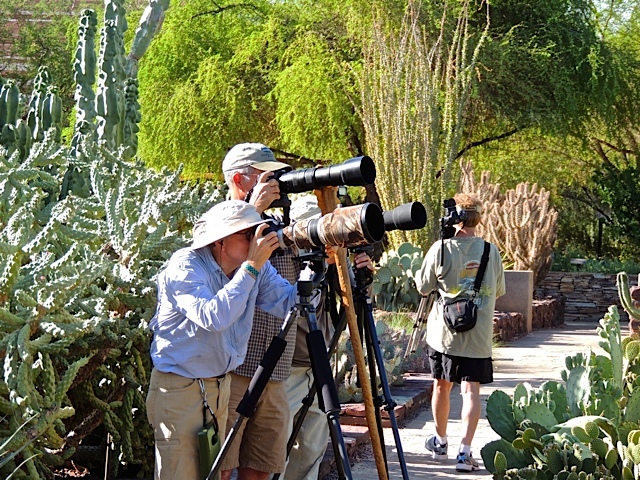 Whenever I go to the Desert Botanical Garden, there are always a lot of photographers around and every now and then, they will form a group all focused on one thing. This group was focused on a nest of doves. I got to wondering what you might call a group of photographers. There is a "gaggle" of geese and a "herd" of cattle but, what is the name for a group of photographers? I consulted Google and found suggestions like "focus", "tripod", and "shot" but I thought "click" fit the most. So, I'm calling this a "Click" of photographers. 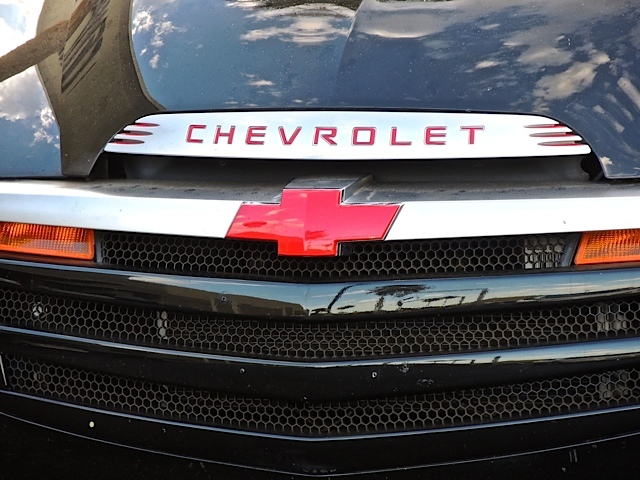 I stopped at the grocery store early one morning this week and saw this snazzy looking truck in the parking lot. I've never seen a model like this but, I kind of like it. 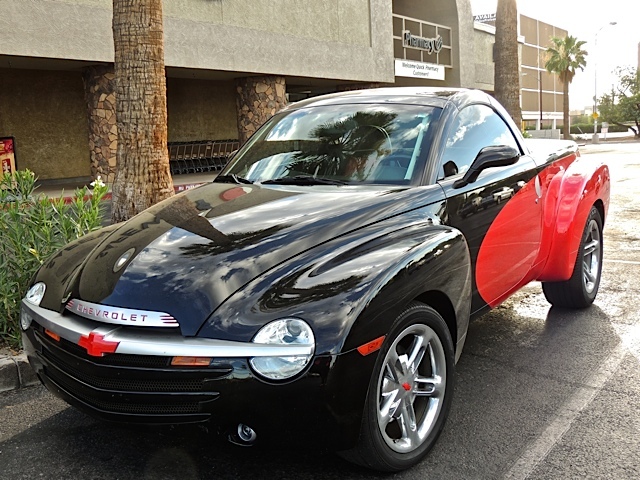 The color combination of black and red looks good together and that shine is reflecting the little puffy clouds we had in the sky that day. There is a new gelato place in town called Frost and it's located at Biltmore Fashion Park shopping center, right where I usually shop. 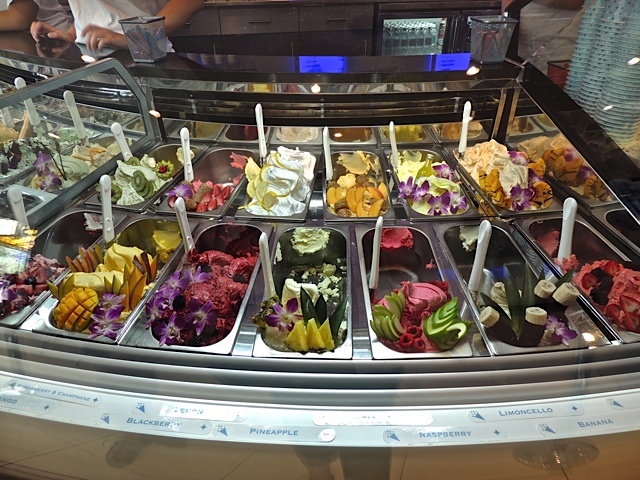 To top things off, they display their frozen delights beautifully with cut fruit and flowers. Since pistachio gelato thrilled me when I was in Italy two years ago, I ordered a scoop of that and I wasn't disappointed. It was delicious. I'll be back to try some other flavors. This could be a dangerous spot for me. 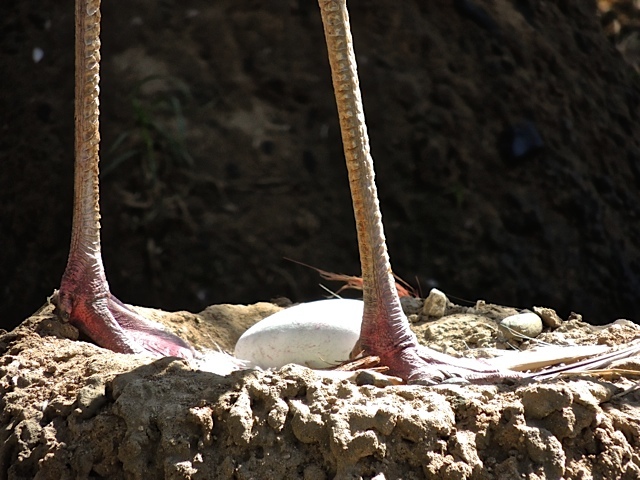 When we were at the Wildlife World Zoo, we saw several flamingos sitting on eggs. This one got up the stretch it's legs. 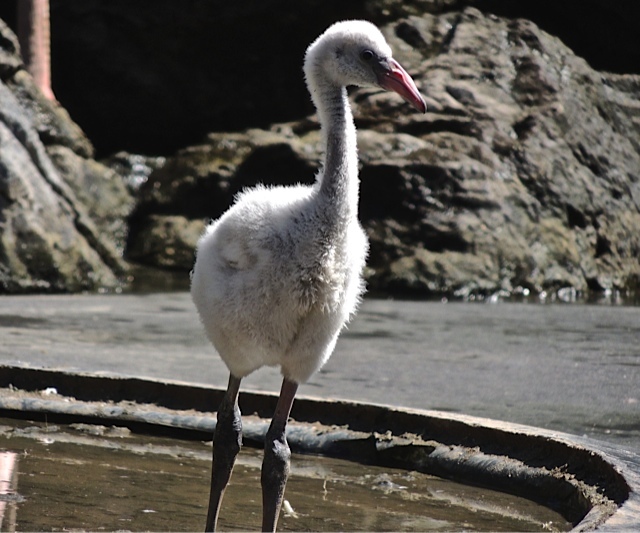 And, one had already hatched because this fluffy little baby flamingo was wobbling around with the others. On Saturday morning I once again joined Janet and her guests for a trip out to the Wildlife World Zoo. We braved the 100+ temperatures and had the zoo almost to ourselves. 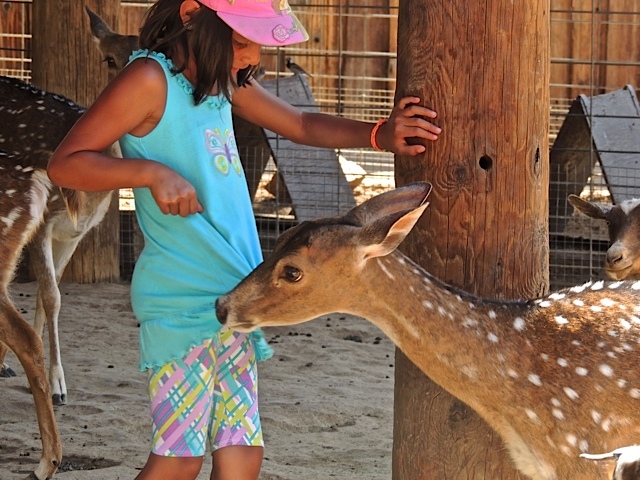 In the above photo, Emmalin went into the petting zoo to feed the animals but this young deer took a keen liking to the hem of Emmalin's top. She managed to pry the shirt away and give him the handful of food she was holding for him. 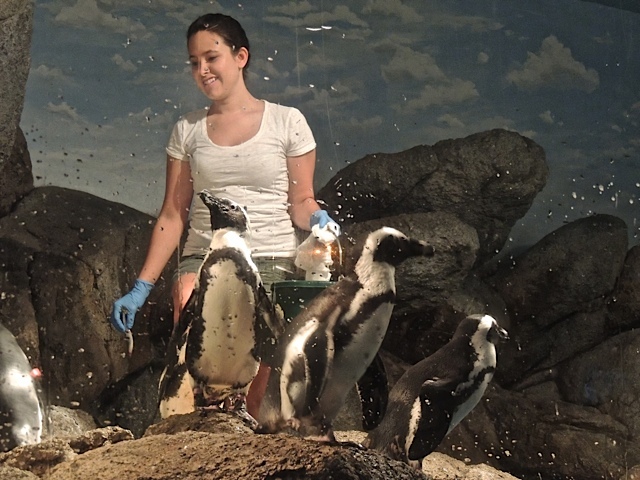 We all enjoyed watching the keepers feed the penguins. Tomorrow I'll show you what else we saw that day. 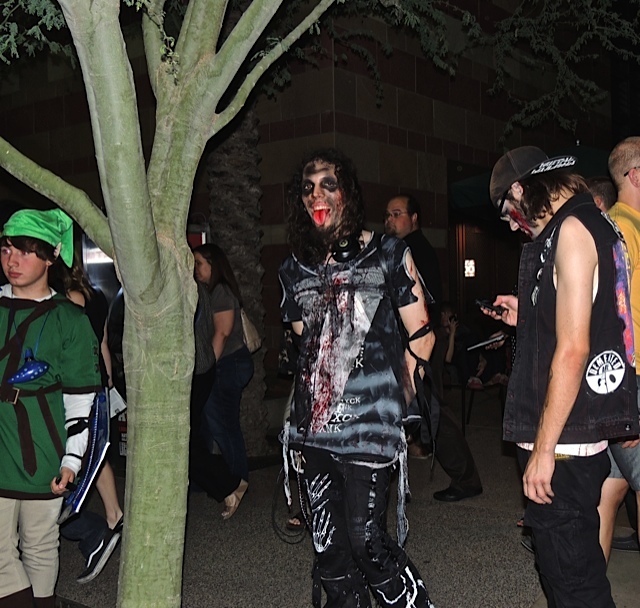 The "Comicon" or Comic Convention took place at the Phoenix Convention Center from June 5th through June 8th filling downtown Phoenix with a huge variety of costumed participants. Since I was down there Friday night for the symphony, I took the opportunity to snap a few shots of some of the characters I saw. 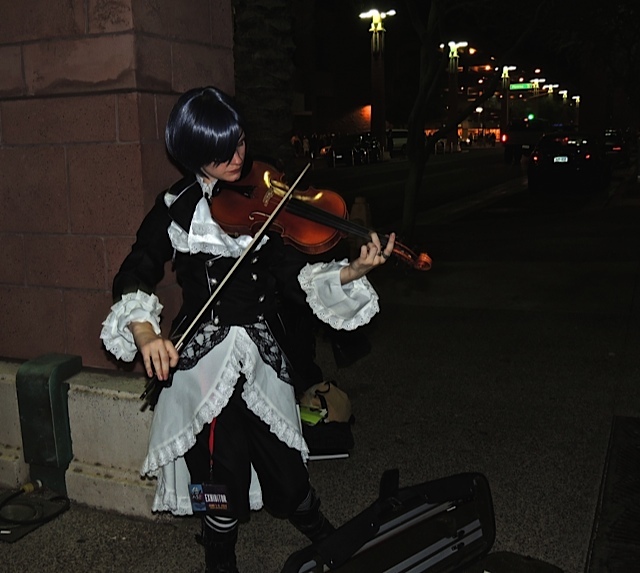 This young person was playing the violin right outside Symphony Hall. These handsome fellows were enjoying the talents of the young violinist. 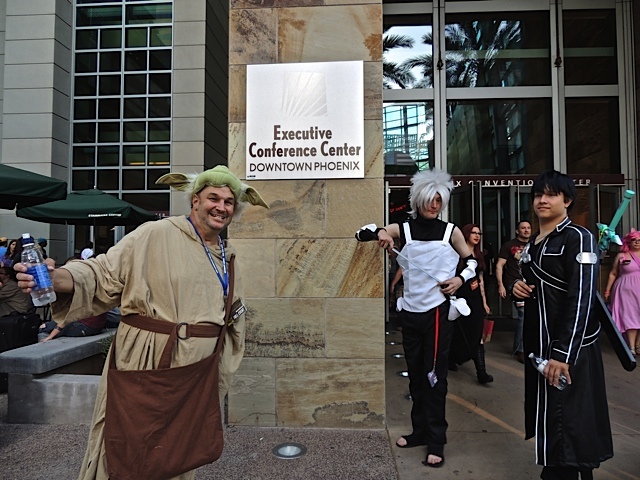 This group was having a conversation outside the conference center when I pointed the camera in their direction. It was so busy downtown that it felt similar to walking the streets around Times Square in New York. It was wonderful seeing downtown Phoenix so colorful and lively. I have a new post on Sharon's Sojourns today. I'm visiting a ghost town. It's been a busy weekend so far. 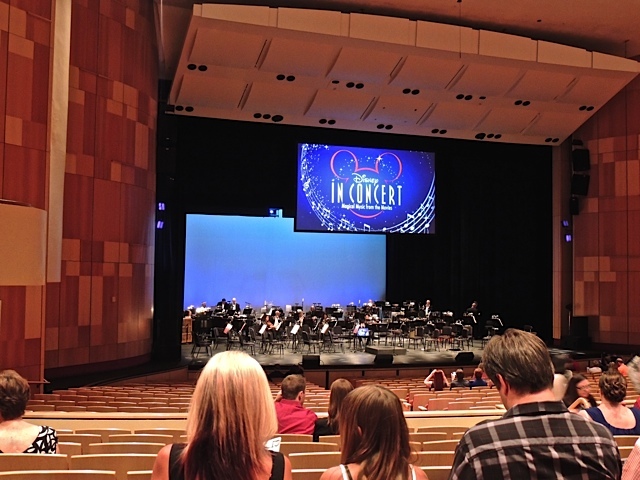 Friday night I joined my friend Janet along with her niece and her niece's daughter Emmalin to see the Phoenix Symphony doing "Disney in Concert". Emmalin and her mother are visiting from Montana. I took the above photo before the concert started while a few of the orchestra were tuning up. 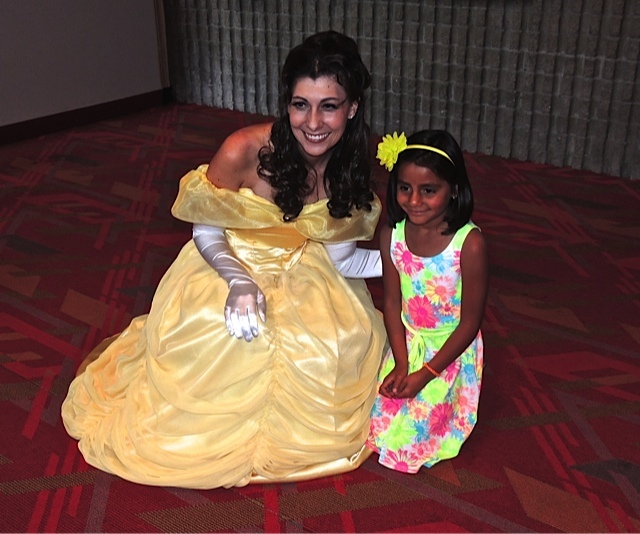 It was fun listening to all the great music from the wonderful Disney movies but, what was even more fun was watching Emmalin pose with the "Belle" before the concert began. Two princesses in one photo! 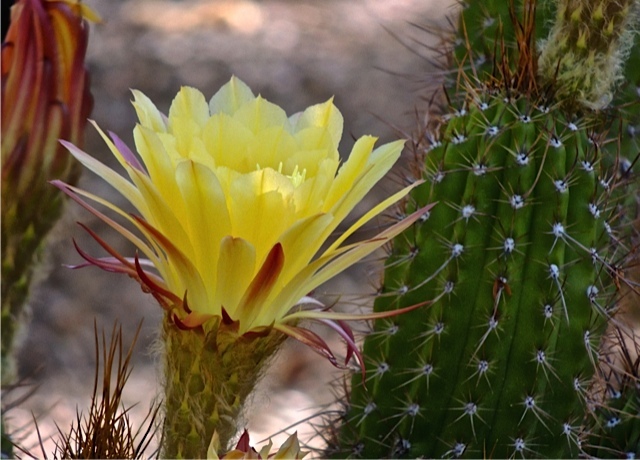 I hit the cactus bloom jackpot on Friday morning when I took my walk at the botanical garden. 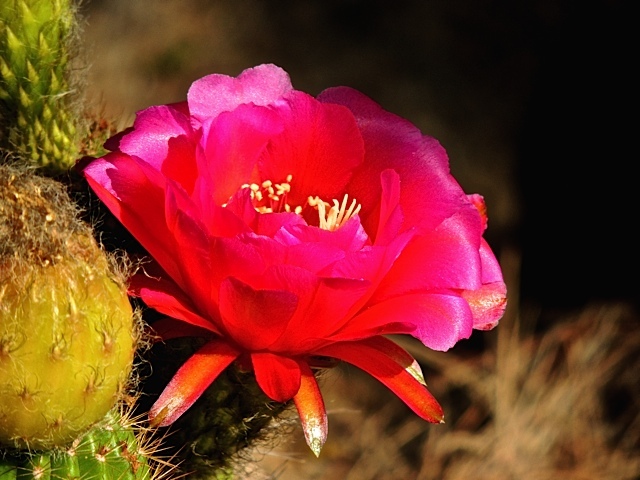 In one little corner of the garden, almost all the cactus had blooms on them. Everywhere I looked another bloom popped up. What was really surprising were the variety of colors. 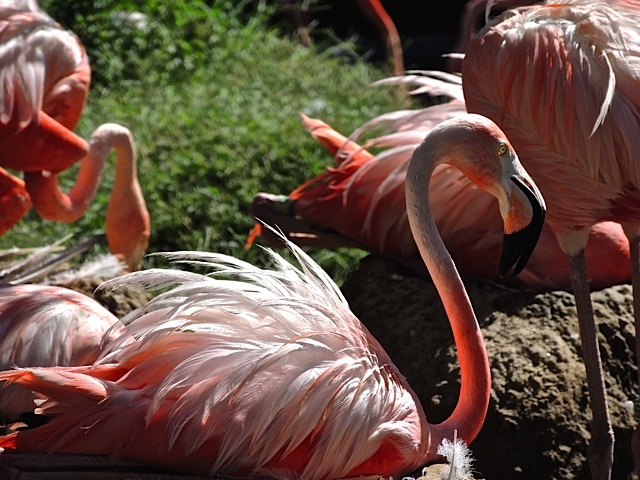 There was a stunning PINK. 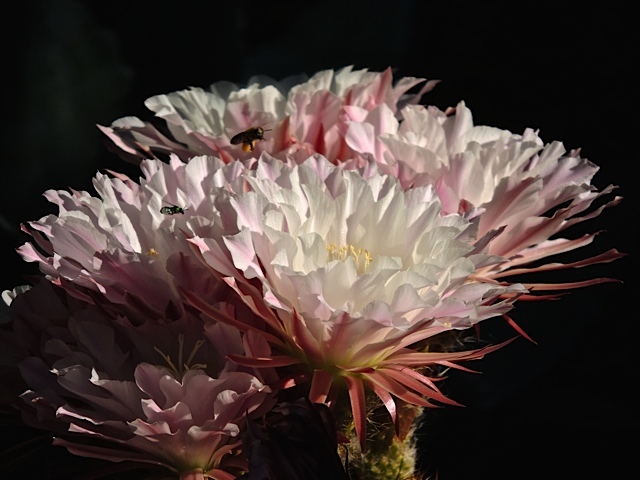 And, a large cluster of WHITE blooms with little tinges of pink on the edges. 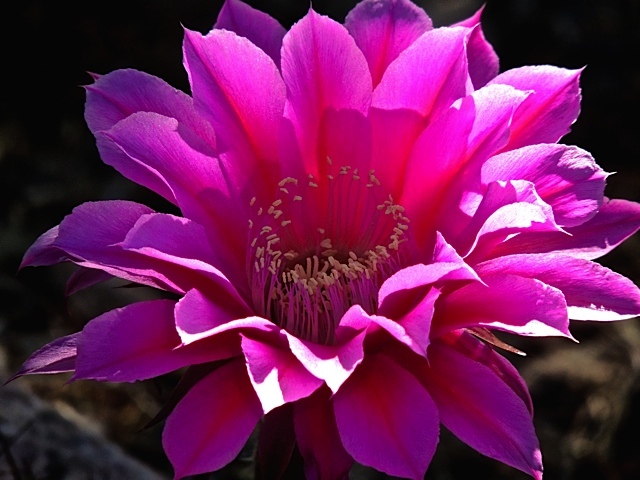 It was a feast for the eyes and it proved to me that the cactus in the garden still have some blooms this season to surprise us with. 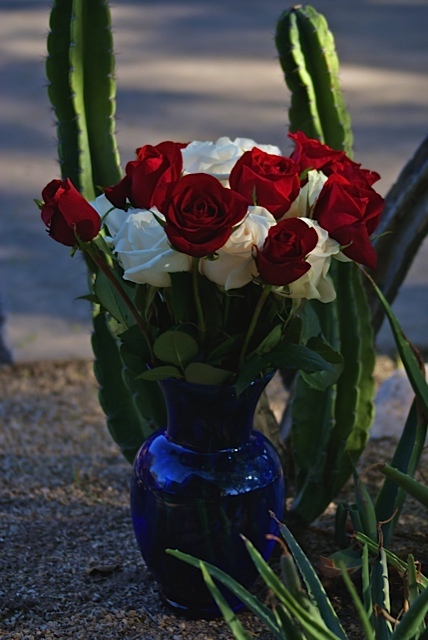 A lovely bouquet of roses to commemorate this anniversary of D Day!